Tahani Baakdhah is a published author, U of T PhD student, and avid crocheter with an eye for business. Since 2012, Baakdhah — or the Purple Lilac, as she is known on her social media — has been using Etsy, an e-commerce website focused on handmade or vintage items, to sell her crochet creations. Crocheting is a process of creating fabric or 3D objects by interlocking loops of yarn or thread using a crochet hook, similar to knitting. Baakdhah self-financed her first crochet models, which were custom toys for her children. She has since combined her interests in medicine, education, and crocheting in a business that provides educational crocheted models of human organs and cells. Baakdhah began her PhD research in U of T’s Institute of Medical Science in 2012. The aim of her research is to use biotechnology to make large numbers of retinal stem cells to replace cells lost to retinal degenerative diseases. This is useful in treating diseases and providing cures for people affected by retinal issues. In 2010, Baakdhah taught herself how to crochet by watching YouTube tutorials. Two years later, she was asked by SciCommTO — a network of science communications professionals that organizes events — to introduce crocheting to a Knit-a-Neuron Workshop. She has also taken part in Etsy pop-up shops in Toronto. This past October, she participated at the Breaking Down Barriers STEM conference at the Bahen Centre for Information Technology. The event was run by hEr VOLUTION, a nonprofit organization inspiring girls and young women to pursue STEM careers. In many ways, her entrepreneurship is admirable for its unorthodoxy. Crocheting is not usually what comes to mind when we think of starting a viable business, but Baakdhah insists on the value of creativity. Its relative low cost and almost universal application are helpful factors as well. Speaking on her busy schedule as an entrepreneur, researcher, and mother, Baakdhah admits that it is impossible to balance all her responsibilities fully, but “organization really helps.” As with all things, a certain degree of enjoyment is also vital for success, and Baakdhah embodies this with her quirky creations and wholesome social media persona. She frequently posts and advertises her latest creations on Instagram. She counts about 2,780 followers and over 1,400 posts, the majority of which are highly detailed displays of her crochet creations and the various organs or cells they are meant to represent. She also uses Instagram’s stories feature to link to her Etsy shop as a means of facilitating sales. Instagram has undoubtedly been a useful tool in promoting her business. 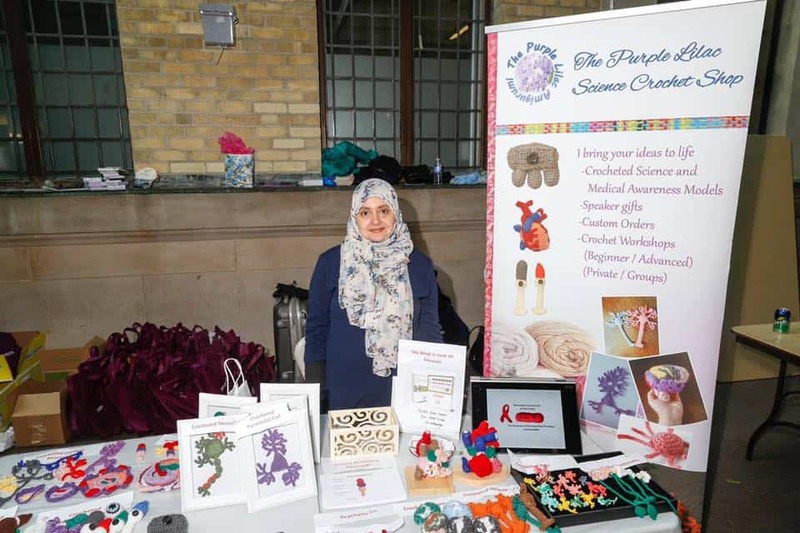 Baakdhah plans to expand her online business by creating new models and patterns, launching her own online store, and starting science crochet teaching classes as a way of facilitating science communication, education, and outreach. She is also in the process of putting together her second book, Crocheting Neuroscience: The Brain. Baakdhah is an example of the possibilities of student entrepreneurship and the oftentimes unlikely crossovers between disciplines that occurs as a result.